How would you like to create a more positive impression of your company in the community and attract more business? With Earth Day quickly approaching (April 22), now is the perfect time to show your concern for the environment and promote your business. Studies show that companies that support sustainability practices (i.e., practices that support a healthy environment) are viewed more favorably by consumers. Here’s the good news: there are many cost-effective ways to promote your company while practicing “green marketing.” Our featured promotional items encourage environmental responsibility and span a range of price points to fit any budget. When you make the decision to use environmentally friendly promotional products, you are letting your customers know about your commitment to a better future and a healthier planet. 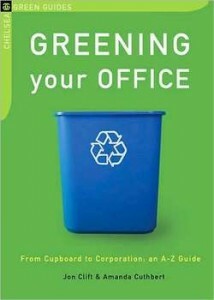 Want to get even better results with your next environmentally friendly promotion? Consider including tips for “”living green” or creating a continuity program of monthly gifts using eco-fiendly promotional items. Social media is another great way to get the word out about your eco-consciousness. Consider giving a free earth-friendly promotional product to everyone that becomes a fan on Facebook, or to anyone who posts something positive about your company in LinkedIn or Twitter. This will serve as a reminder about your commitement to our environment and promote your product or service. The sky is the limit when it comes to creative ways to promote your business and be eco-friendly. Want more ideas and expert help with your eco-firlendly promotion? Call us today! We’re “green marketing” professionals and can create just what you’re looking for on time, in budget and using sustainable materials. The more unique your giveaway, the more memorable it will be. 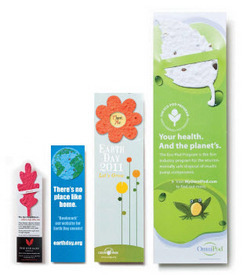 This innovative bookmark is made of 100% recycled paper and will grow wildflowers when planted and watered. Choose from hundreds of stock shapes for the seed paper component of the bookmark, or create your own custom shape (extra charge applies for custom shape). Price includes full-color imprint on one side of the bookmark. This item works well for promotional themes around growth and new beginnings. Convenient recycling starts here! 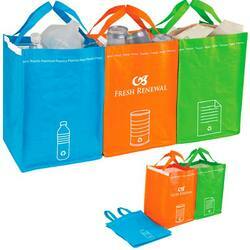 These bins stick together while collecting and back apart while toting around. Set contains three bins to separate metal, paper and plastic. Velcro on each bin allows for them to be carried separately as totes or attached together as bins. Each bin has a pre-printed icon on the front. This item works well for real estate companies and other businesses that are involved in home decor and organization, or for organizations that want to encourage recycling in the workplace. An alphabetical guide (A-Z) to energy and resource saving tips for offices of all sizes, from energy use to better supply purchases, to recycling and reusing materials, plus summaries of a range of renewable energy options, commuting techniques, and more. Made from recycled paper. Includes one-color cover imprint with your logo or message, with the option to tip in a custom page 1 branding message. This item can be used as part of a company’s internal program for encouraging employee to conserve, or for property managers to share with their tenants. Plastic bottle and lid will break down in 5 years in an industrial composting unit. Flip-top lid with ergonomic bottle shape. BPA free. 22 oz. Price may vary based on decoration. This item can be used in conjunction with an employee wellness program, or to discourage the use of disposable plastic water bottles.